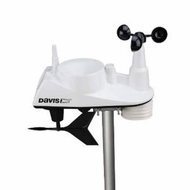 The Vantage Vue weather station combines Davis’ legendary accuracy and rugged durability into a compact station that’s easy to set up and use. Vantage Vue includes a sleek but tough outdoor sensor array and distinctive LCD console. The compact sensor array measures current weather conditions, including temperature, humidity, barometric pressure, wind speed and direction, dew point, and rainfall. Sets up in minutes and starts sending data wirelessly to the indoor console. The console also displays weather forecast icons, moon phase, sunrise/sunset times, graphing of weather trends, alarms and more. The unique Weather Center function provides additional information on each weather variable. In addition, Davis has made Vantage Vue radio-compatible with our flagship Vantage Pro2 stations, so you can mix or match most components.